Didn't start the build but will continue to post progress along the way. 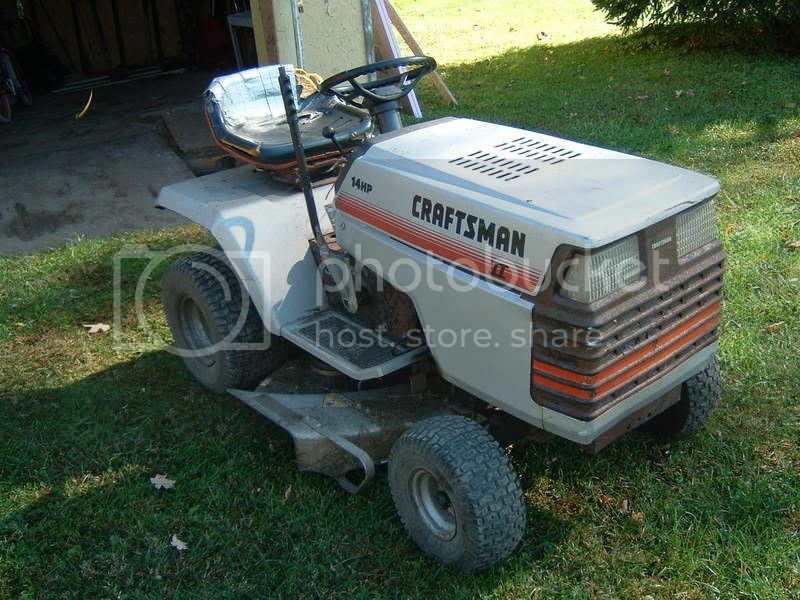 1986 Craftsman II, 14 hp Twin Cylinder. Got the tractor for free and she runs without smoken!! Plans are to Strip down to bare frame, install motor plate and transmission, install a live axle, Peerless 350 transmission, Run the 14hp twin cylinder til she blows! 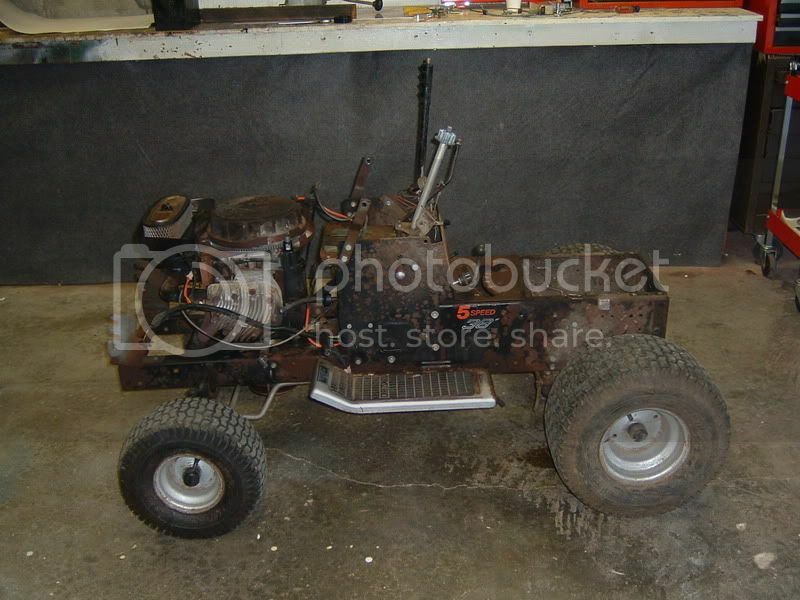 Here's the hard to find PEERLESS 350 3 speed transmission!! Started some of the teardown today. Didn't have much time (wife had me putting a new tile floor in the bathroom), but it is amazing what 15 minutes and a 9/16" socket can do!! Mowman...can you read us the tag...? OK...Here's the word from the G-Man himself...on the 350 vs 400 debate!!! Well looks like I have to change my settings on Mow Better Forum so I get some of this coming my way again. Seems there are tons of questions about my Favorite Trany. The Peerless 350/400. So here I am to answer some questions. The Peerless 350 or 400 trany are the same dam trany!!! But the 350 has bushings and the 400 has bearings. The 400 also has TWO output shafts some people think. 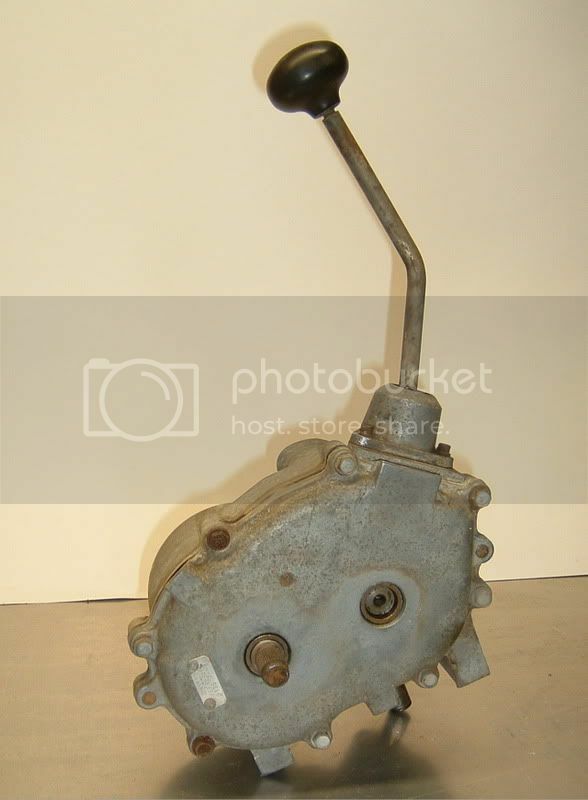 But in fact the 400 has one output and one Brake shaft. Now both the 350 and 400 have all the same gearing on the inside. Same shift pattern and so on. The 350 SHOULD NEVER BE RACED WITHOUT ME OR G TEAM REBUILDING IT!! The reason is I have a race proven recipe that will make it into a durable racing trany. 350 with bushing can't be raced in anyway before mods are done. The 400 has bearings and has lube and that is good. WAY better then the 350. BUT it does not have a vent and will push out oil when it heats up and cools down. The thrust bearings are good but have a plastic cage. I use steel!! The 350 and 400 trany are made for 1,200 rpms input only!!! So mods have to be done to both for them to stand up. So why is my work so cool? I replace all bushing for bearings. I DON'T get them from the small engine dealer. I buy from my local bearing supply store. I have a special mix of bearings. ALL the bearings are NOT what the factory 400 comes with. The seals are special too. They look and work like the factory seals but again it is a G Team Trick. Also the input shaft is special. It is NOT for a 350 or 400 but for another Peerless trany. What so cool about it? Length, key way and there is threads in the end of the shaft to put an bolt in to use in many ways. I charge $150 plus $15 for S&H to go over one of either of these tranys. I put a vent in it too so it can breath like your trucks has. I weld your gears to the outputshaft. I remove reverse and 3rd since most SP, BP and CP racing mowers don't need them. If you run AP and or want 3rd left in I can do that. But Reverse does spin all the time for no reason robbing HP so I remove it. Know this one final thing. There are NO replacement parts for these tranys. So hope and pray the trany you have is in good shape. Once I go over it you will run it for years. I have one from my very first build. I have my second 350 in one of my mowers now. And my BP runs my third trany I have ever built for myself. The first trany is now my spare if I ever do need one. In 8 years of racing that is all I have ever used for 2 of my mowers. I did have an output shaft brake off years ago in WI at a race. But that is the only trany I have ever had problems with. I hope that answers it all. 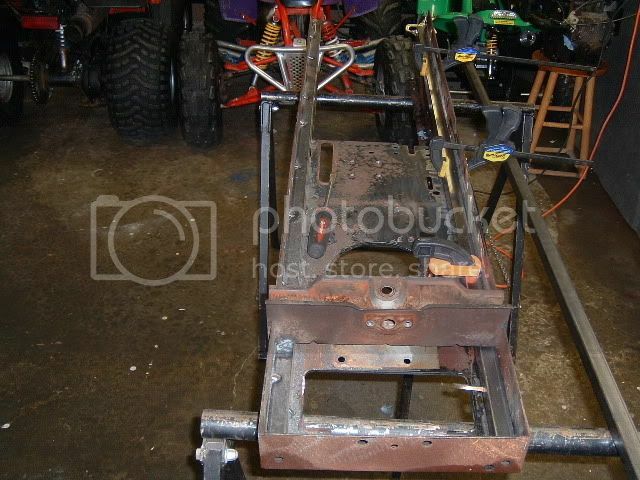 Entire mower is stripped down to a bare frame. 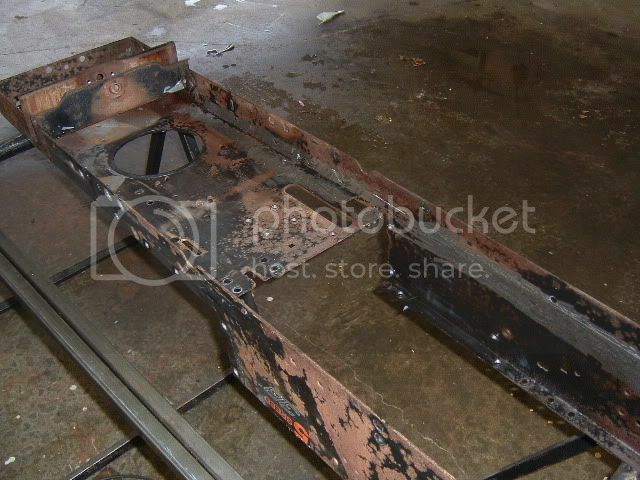 Frame was â€œGUNKEDâ€� and scrubbed nice and clean. Naked Frame! As you can see, from about midpoint back there is no support whatsoever! 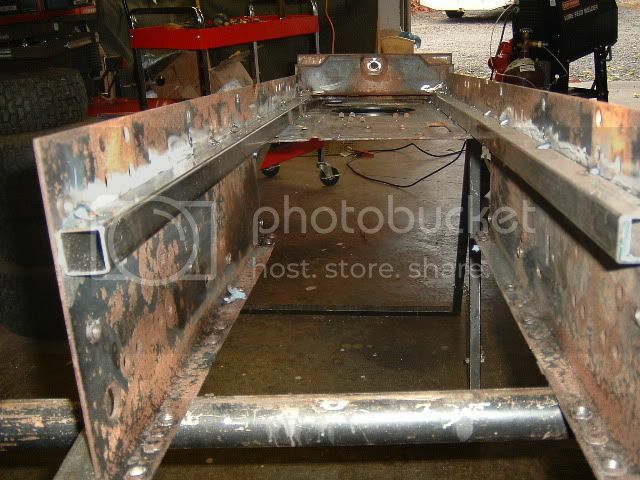 3/4" tubing will be installed to stiffin her up! mowman racer, the frame you got there is like mine. In your last picture, if you look under the front end area the metal was cut out to insert the front end "U" channel type metal. I was told that it will crack in the edge of the cut out metal area. 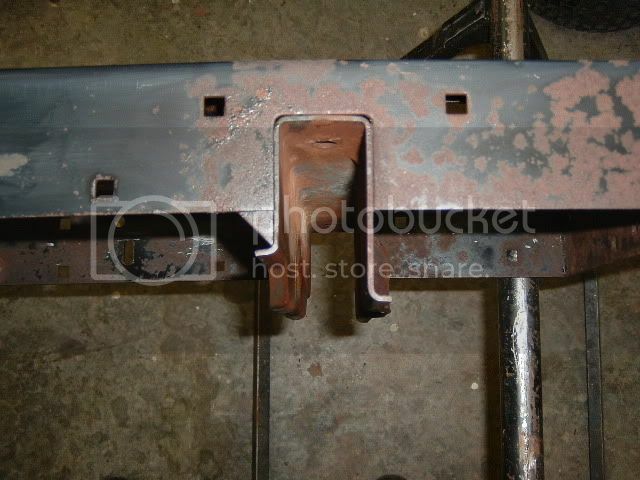 I backed mine up with some angle iron, cut to fit under the "u" channel and welded into place. 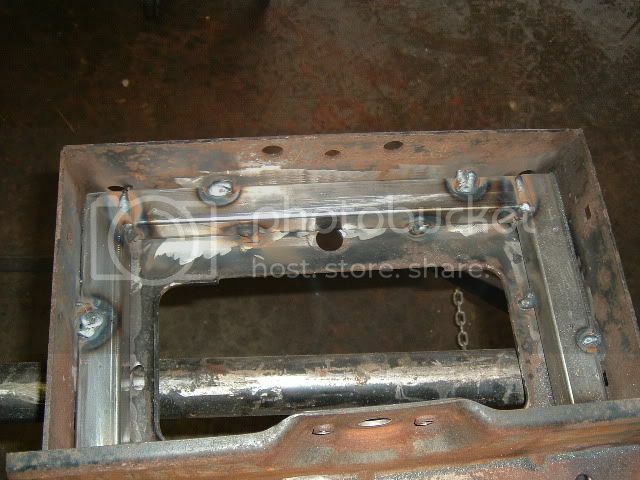 Are you going to use the holes where the brake/clutch rod went through? If so will the square tube get in the way? 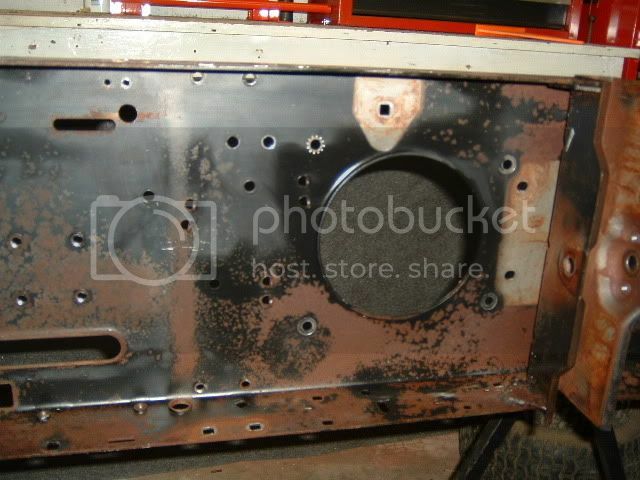 I'm sure the holes will get blocked....but I have a couple plans for the clutch setup. All images above are now thumbnailed to larger images for you Tom. (o;? I like those saw horses! What are they made of and can we get a closer look at 'm? The work bench is tooooo clean. I've got parts all over my shop. Chassis Stands they are called. They are made from mild steel. I worked at a race shop for some time and we used these when we were building new cars or repairing damaged ones! 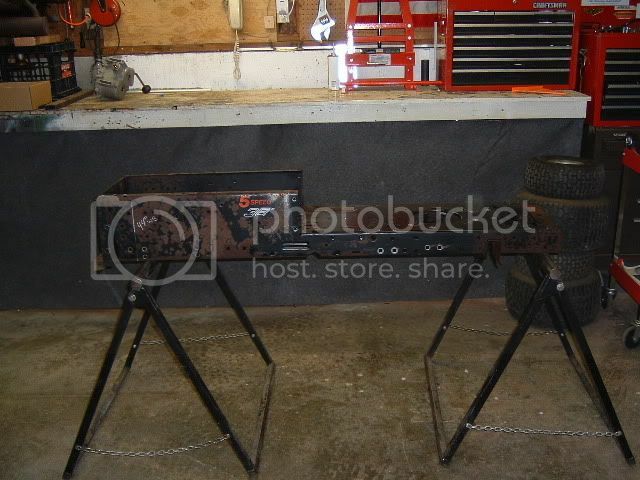 These two stands had sustained damaged when were were at a race at Sebring and got tossed in the garbage. Needless to say.....I grabbed them and repaired them. Yeah they are kinda proud of those things aren't they! But, they are sweet! 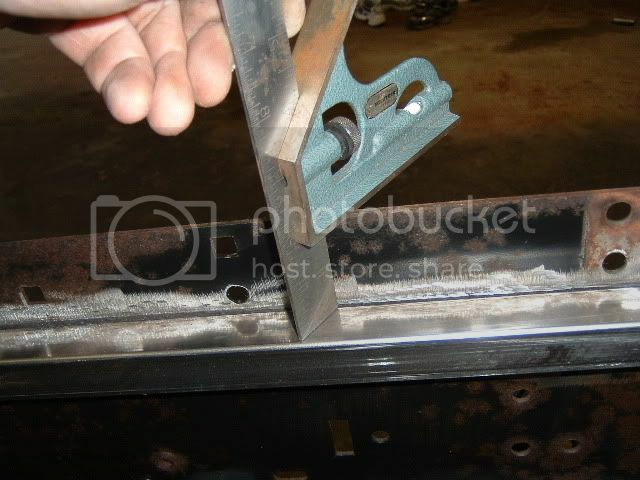 I can see room for a carpenter mod to prevent scattering carbide tips off your saw blade all over the garage! Wouldn't take much, a couple brackets bolted on the edge of 2 x 4 to slide down over the top rail and pin beneath, or bolt through. With that configuration a guy might want to use 1 x 2 rectangular steel on the top beam to help prevent roll, and one could also build a set of those brackets with a roller on them to slip over the top rail. These things could be made really functional with the addition of a few simple mods!! (o:? Played around a little more in the garage today!!! 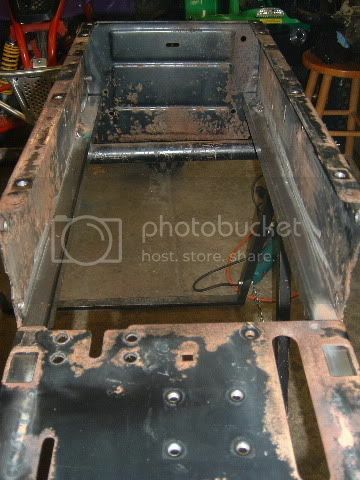 I ground off all raised sections of the frame where I'll be adding x-tra support. 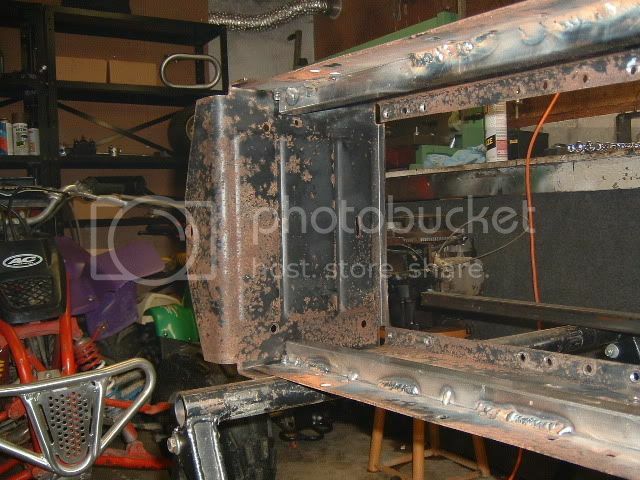 I have the bottom side welded more than it will ever need! I think I added more weight with welding wire than the tubing weighed!! 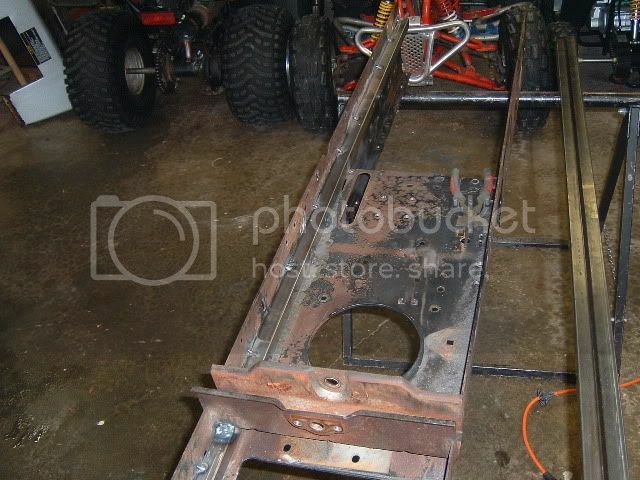 I may be cutting the rails a little shorter in the rear of the chassis for the axle. 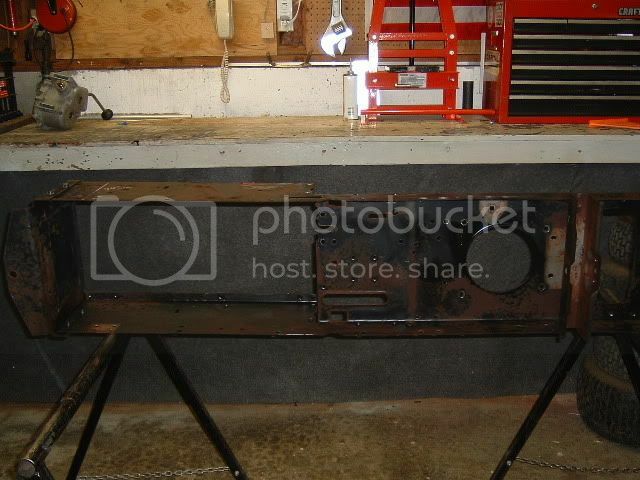 Right now I'd have to notch the rails for clearance for a 1.250" axle and I want to use adjustable cassettes so even more clearance will be needed. I'll know better once they arrive in my hands! Nice, what welder are you using?